This tune is marked as doubtful because though its style resembles that of Carolan, it cannot be stated with certainty that it was composed by him. The title is something of a puzzle But the Complete Baronteage, the authority of which is conclusive, contains no record of any Irish Baronetcy of St. John. 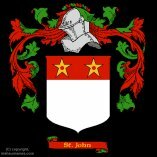 It is, however, possible that in Carolan's time there was a knight named St. John St. John and that this tune was composed for his wife.